This month, our Product of the Month is our SEG Fabric Exhibition Stands. We’ve just launched this range of fabric exhibition stands, available in a range of sizes. These display stands are a fantastic way of promoting your brand at events, exhibitions, trade shows, retail stores and even at photography shoots as a back wall. At XL Displays we believe that fabric is the future of exhibition stands. Fabric is an excellent alternative to traditional PVC graphics for a variety of reasons. The fabric graphic for this stand is printed using a process called dye-sublimation. This is where the ink is fixed directly into the weave of the fabric graphic using a combination of heat and pressure. The result of this process is a photo-quality print that won’t crack, rub off, fade or peel. The fabric SEG (silicone edged graphic) features a silicone gasket that borders the fabric panel. This silicone edge is fed into the channelling on the frame, holding the graphic in place and providing tension. Fabric graphics are lightweight and easy to transport. When not in use they can be folded up neatly and stored away. In comparison on a stand with PVC graphics, each panels needs to be individually rolled up carefully and can take up more storage space. Fabric graphics are also often machine washable, ensuring they look their best for every event you attend. 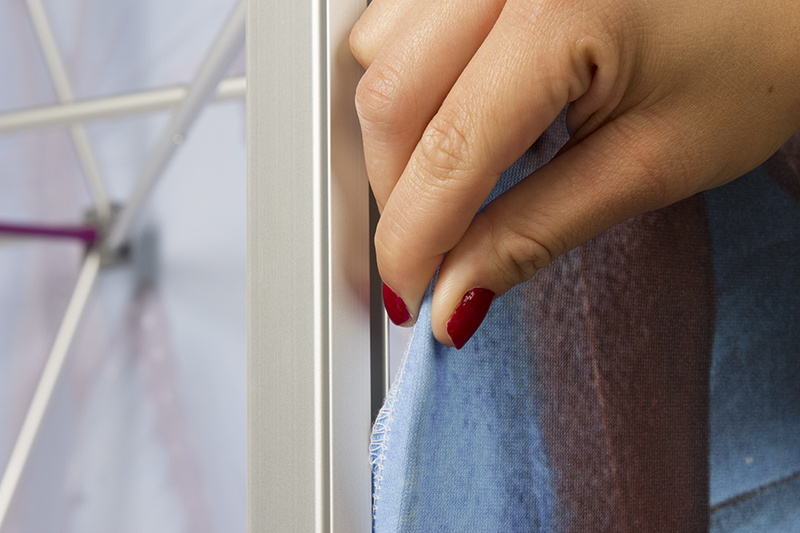 Wash your fabric graphics on a 30°C heat using every day detergent. Just remember to ensure the fabric is completely dry before storing away. Another benefit of fabric graphics over PVC graphics is that they provide a seamless print. PVC displays often use multiple ‘panels’ to create a whole display, whereas a fabric graphic can cover the whole display with a single piece and no panel joins. The SEG fabric exhibition stand is exceptionally easy to assemble, all four sizes of the stand can be set up in just a few minutes by a single person – no tools are required. All of the components come in the convenient carry bag provided. This stand utilises a similar frame to our range of best-selling pop up displays. The frame ‘pops’ up and clicks into position, the channelling bars can then be attached to all four sides on the front and the vertical sides on the rear of the frame. Lay the frame down on the floor with the front facing upwards – lay the fabric graphic over the frame. Feed the silicone gasket of the fabric graphic into the channelling. Stand the frame up and the SEG fabric exhibition stand is ready to use. A pair of stabilising feet are included with the SEG fabric exhibition stand and provide extra stability to the display, however they are not required for the stand to be used. A carry bag is included with the SEG fabric exhibition which fits each size. The 3x1 SEG stand comes with a non-wheeled bag as standard. The components of the stand each have their own section in the bag which provides protection during transportation and storage. 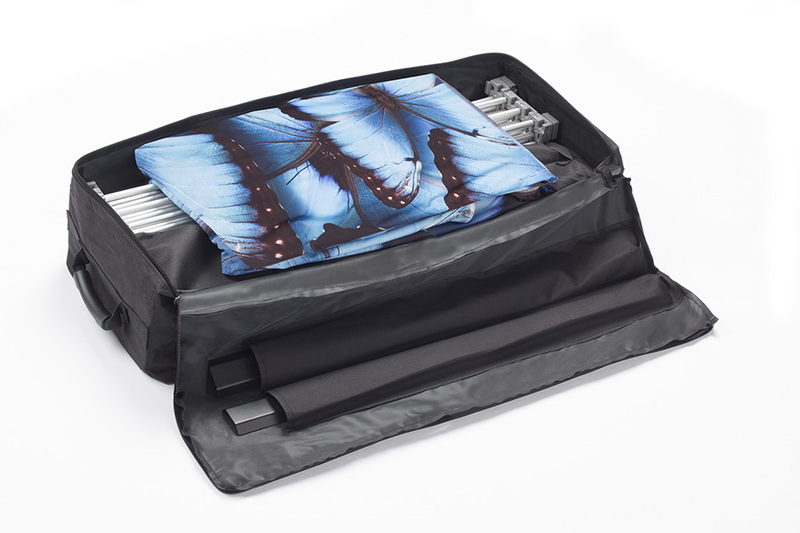 The SEG fabric graphic can be folded up and stored in the carry bag without risk of damage. These stands are lightweight, with the largest stand weighing just 15kg. The portable nature of the stand makes it ideal for events and exhibitions that require long-distance travel. A fantastic feature of the SEG Fabric Exhibition Stand is the ability to link them together, either in a straight line or at a 90° angle. The stands link using straight and corner linking clips – these allow you to create an impressive, large exhibition backdrop at an affordable cost. If you are interested in linking these display stands, please contact us or call us on 01733 511030 for more information. The SEG fabric exhibition stands range starts at just £310 for the 3x1 stand up to £575 for the largest size. Our SEG fabric exhibition stands include everything you need to start exhibiting right away and due to the durable frame and graphics, can be used over and over at many events. If your marketing message changes frequently then it’s easy to keep multiple sets of interchangeable artwork. You can swap the artwork in just a few minutes. The SEG fabric exhibition stand comes with a 10 year guarantee on hardware (excluding graphics) and has been built to last. On a tight schedule? No need to worry – We offer short lead times on the SEG Fabric Exhibition Stand with the stand being dispatched within 3-4 working days on receipt of your print ready artwork. If you do not have any artwork, we offer a graphic design service and one of our designers can create your display stand for you in line with your brand. Contact us to find out more. For more information on our SEG Fabric Exhibition Stands, contact us or call us on 01733 511030. At XL Displays we are experts in exhibition stand design and provide everything from custom exhibition stands to portable displays such as Pop Up Stands, Roller Banners and Promotional Counters. No matter what the size of your event or budget we can help.